Because the Thanksgiving Holiday was late this year we have one less week until Christmas. Actually, Hanukkah is being celebrated extra early. So one must be out and about enjoying the holiday shopping experience (unless, of course, you are one of the plan-ahead people who finish their gift list in July). There are alternatives to fighting for parking places at the mall. My poor car was hit the other day by a woman who pulled out of a space without looking, fortunately no one was injured, but it surely didn’t put me into good spirits. Many shoppers are online, many use catalogs. But whatever method you use there are occasionally price shocks. For instance, one might think a safe gift would be a scarf for the hard-to-buy-for gentleman on your list. In one of my favorite blog resources, The Wall Street Journal featured a small article “The Wrap Game” Nov.9, 2013 . Illustrated were 5 scarves of various fiber contents ranging in price from $75 to $605 !!!! But that wasn’t bad enough. In the Style and Travel section, Tuesday, Nov.21, 2013 Christina Binkley wrote an article entitled “Sweater Sticker Shock”. These basic-looking sweaters carried a heafty, not-so-basic tag of $1,250 to $2,000. For a sweater!! And they didn’t have any jeweled trims or hand embroidered embellishments, nor a faux fur collar. I don’t know about you, but to me this seems crazy!! This week I was going through my “idea”file. I’m sure you all have a folder of creative ideas, cut from favorite magazines. This idea was from Threads Magazine, 2011. 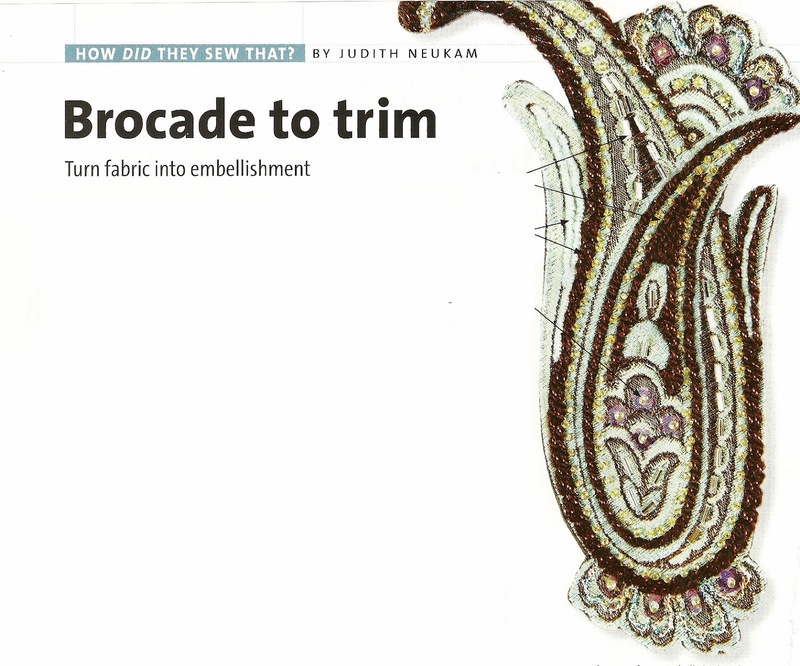 The article, “Brocade to trim” by Judith Neukam, raised innumerable possibilities of using a design element cut from a fabric remnant, adding beads, sequins, or embroidery. This can then be appliquéd to any garment. Think of a plain blazer or small clutch bag. 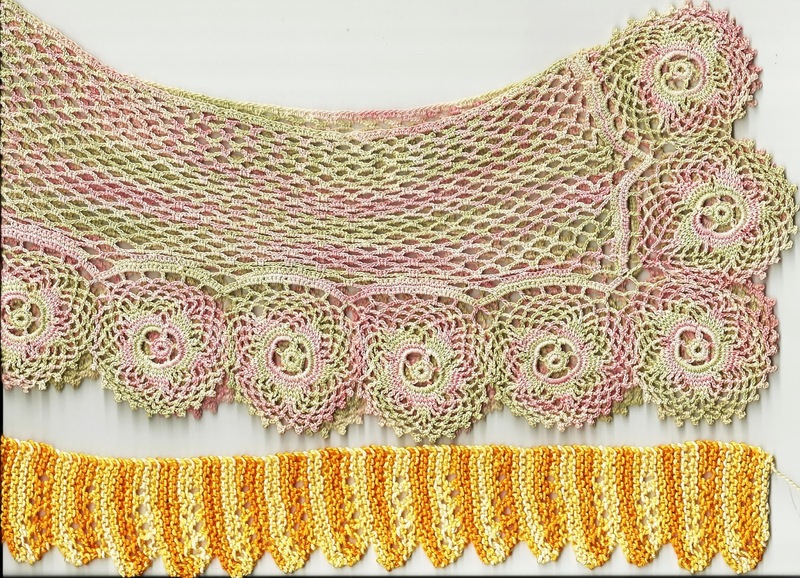 Or scour your stash of crochet pieces to use as a collar or cuffs for a sweater. Using less expensive purchases,personalized by your hand work, makes a truly unique gift that shows how much you care ( not to mention your incredible creativity). Happy shopping, the Holidays are here!